With tools, cookware and food, kitchens are the most difficult room in the house to organize—and the most frustrating room in the house when you don’t have enough ways to keep everything sorted and accessible. 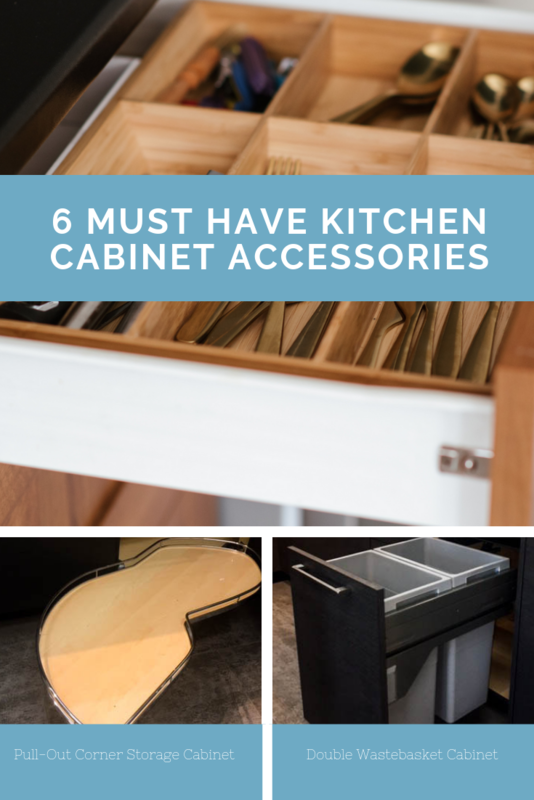 If you’re looking for ways to add more storage or to keep the necessities organized, then you must check out the following six cabinet accessories below! This is our number one most popular kitchen organizer. 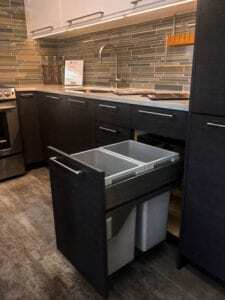 It’s a pull-out cabinet that features space for two wastebaskets, which gives you a convenient place to put trash as you are cooking, and also makes it easier to keep your recycling sorted. 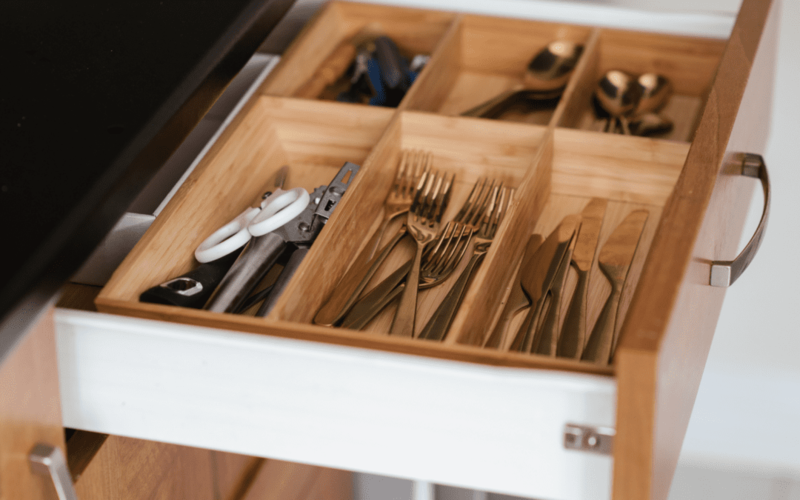 Most cutlery drawers rely on a single layer of built-in organizers or removable organizers. This drawer, however, maximizes the use of interior space with two tiers of cutlery organizers. The top level slides out of the way so you can easily access the lower tier. This is a great place not only for silverware, but for kitchen tools and other utensils, too. Lazy Susans have been the standby for corner cabinets for decades, but these days, there are more innovative LeMans options available to make use of corner space in the kitchen. Pull-out corner storage is becoming much more popular because these cabinet inserts allow you to pull out the shelves completely so that you can view everything you’ve stored inside. These cabinets make great places to keep things like canned goods and spices organized. If you’re tired of chopping blocks and utensil canisters cluttering up your countertop, then you definitely need a vertical utensil storage cabinet. This cabinet features a pull-out design, and inside, you’ll find flexible chopping blocks to store knives and scissors, a canister insert for serving spoons and other taller utensils, and a lower shelf that you can customize to store whatever you like. Whether you have a small kitchen or you’re simply looking for ways to maximize on your storage space, toe-kick drawers are worth a look. 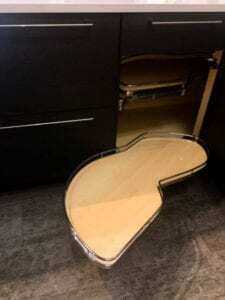 As the name suggests, these drawers replace the toe-kick that protects the cabinet base. Tap the drawer with you toe, and it slides out to reveal the perfect drawer for storing large but thin kitchen tools, like cookie sheets, baking pans and cutting boards. In many kitchens, hanging pot and pan racks are the way to go because nobody wants to deal with tippy stacks of pots and pans that are hard to get in and out of cabinets. But, not everyone likes the look of pots and pans hanging up, plus, when they’re exposed, dishes that aren’t used often tend to get dusty—just one more thing to clean every so often. If you’re looking for a solution to these problems, check out the hanging pot-and-pan cabinet, which features a pull-out rack of hangers so that you can keep your cookware organized, clean and easily accessible. If you’d like to see each of these organizers in action, you can always visit our showroom to take a look. Also be sure to check out the video below, which features a demonstration of each of the organizers listed here!